Before the arrival of Spanish colonizers to our shores, early Filipinos believed that wearing powerful, mystical amulets or talismans would protect them from harm or even give them special powers. 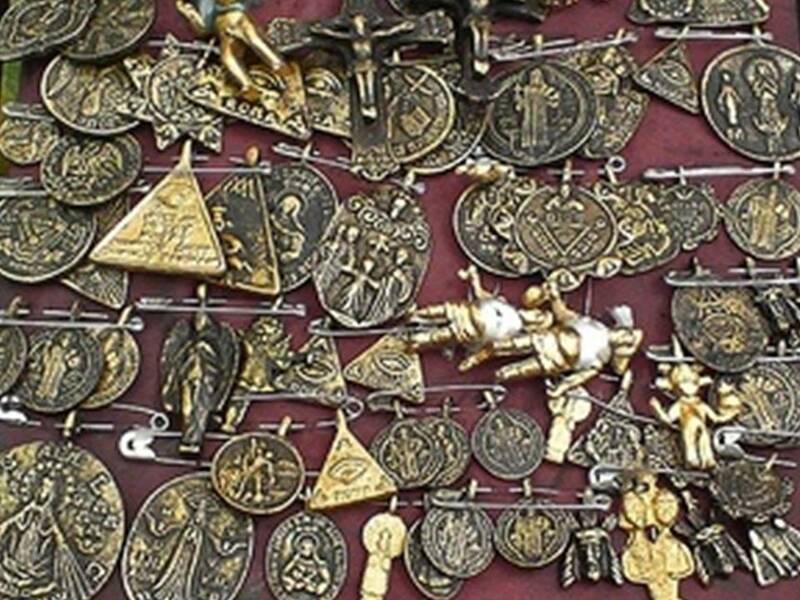 Called agimat and anting-anting, these mysterious objects have survived for centuries, thanks to the later inclusion of Christian iconography. Shrouded in myth, meaning, and symbolism and long kept secret from the rest of society, the stories about agimat and anting-anting are revealed in a special exhibit at Yuchengco Museum entitled Pinoy Power Packs: Agimat, Anting-Anting , and the Stories They Tell, on view starting August 15. Agimat and anting-anting illustrate our folk beliefs, spirituality, and view of the world: they are a fusion of a belief in nature and in a concept of God who is both animist and Christian. 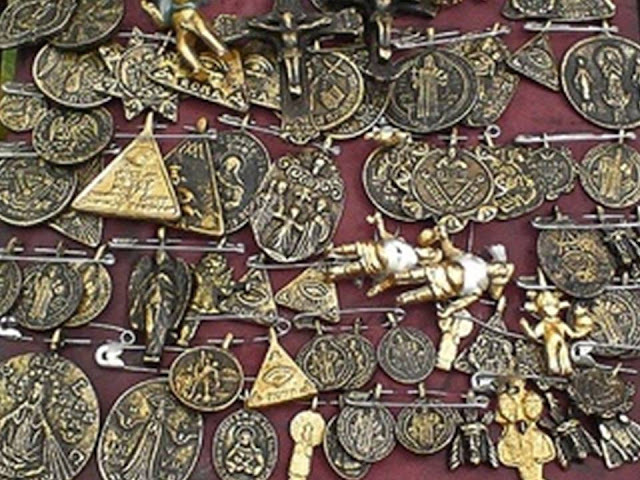 They can be seen as our way of seeking to approach God and hold the power of God within a medallion, handkerchief, or vest, creating a powerful divine connection that gives the wearer god-like qualities. Pinoy Power Packs explores the animist symbols and icons found in agimat, from the all-encompassing Infinito Dios to the many forms the Infinito manifests. The exhibit also looks at how these iconsincorporate Christian imagery, such as the crucified Christ, the Virgin Mother, and the Santo Niño. In addition, Pinoy Power Packs highlights our modern interest in our folk spirituality, as seen in nativist movements such as the Rizalistas and Lapiang Malaya (Freedom Society), and in films such as Nardong Putik. Visitors can watch videos of an artist shopping for agimat in the streets of Quiapo in Manila, or of a young healer and practitioner explaining the various motifs seen in agimat. Pinoy Power Packs juxtaposes examples of talismans from the late 19th to the mid-20th centuries, along with colonial religious sculpture and contemporary art by National Artists for Visual Arts Ang Kiukok and Benedicto “BenCab” Cabrera, the late Santiago Bose and Roberto Villanueva, and Leeroy New. Lenders to the exhibit curated by Floy Quintos include Romeo Allanigue, the Bose family, Jaime Laya, Richard and Sandra Lopez, Ramon Lucas, Lisa Ongpin Periquet, and Dennis Villegas. In order to shed more light on these icons, related talks will be held. Pinoy Power Packs: Agimat, Anting-Anting, and the Stories They Tell is on view at Yuchengco Museum from August 15 to November 7, 2015. The museum is located at RCBC Plaza, corner Ayala and Sen. Gil J. Puyat Avenues, Makati. Museum hours are Monday to Saturday, 10 a.m. to 6 p.m. For more information, call (632) 889-1234 or visit www.yuchengcomuseum.org.